Panarellina cake is simple and quick to prepare, really perfect, soft and fragrant that has a great particularity, you have to bake AT COLD OVEN. In Genoa it is a classic to buy for children's birthday. Melt butter and let it cool. Put the whole eggs and the icing sugar in a bowl and beat with electric whips until the mixture is frothy and whitish. It will take about 10 minutes. Chop the almonds in the blender or in the mixer and add them to the beaten eggs by turning with a spatula so as to mix them together. Add the melted and cooled butter and continue to beat with the electric whisk until it is well whipped up. Add the aroma of bitter almonds and mix. Add gradually the sifted flour, the starch and baking powder and mix together all the mixture for the panarellina cake. Butter and flour a mold about 22/24 and pour the mixture inside, leveling the surface well. Bake the panarella cake WITH COLD OVEN AND NOT PREHEATED then turn on the oven at 180 ° STATIC and cook the cake for about 40 minutes. Check that the panarello cake is cooked and take it out of the oven. Allow the panarellina cake to cool completely before powdering it with icing sugar. VARIATIONS AND ADVICE: You can make a GLUTEN FREE version by replacing the 80 grams of flour with the same amount of almond flour. Never bake in a hot oven or it will not be good. 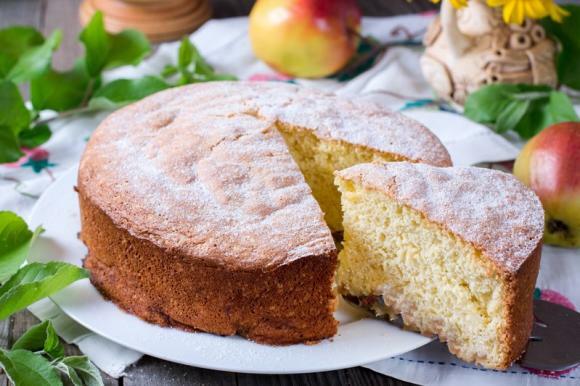 You can fill the panarellina cake with PASTRY CREAM or ZABAIONE CREAM. If you want to make the classic designs of this cake with icing sugar, prepare a sheet of paper and cut the squares. Preservation: The panarellina cake is kept covered with transparent film for about 3 days.